I have so much trouble with full on minty mouthwashes, I am getting this for sure! My teeth say thank you! 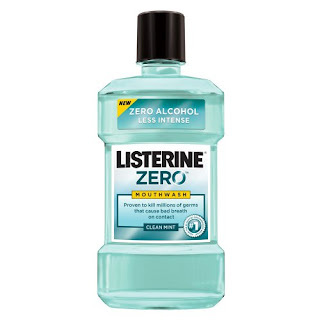 The alcohol-free Listerine Zero was created because of the fears of oral cancer from regular Listerine after an Australian study linked the alcohol in mouthwash with the disease. That's really interesting to hear about the link to oral cancer. Do you have links to the studies? I guess regardless, it's all the more reason to to take up this non-alcoholic mouth wash then. Thanks for sharing the link, Google search does suggest there is a possible link but I still think the benefits of a mouth wash in terms of keeping mouth healthy outweighs the small danger. One of the things to remember is if it is too intense for you, reduce the duration of use in the mouth/use less of the product and substitute it with a non-alcohol version like this one. I don't use mouthwash everyday, but I do use it a few times a week to maintain my oral hygiene. i love your review i have done one myself. I agree with the need to remove alcohol but this is not even considered to help kill gingivitis anymore ! !